Using a single mosfet (IRFP 460) in an Armstrong oscillator, I was able to obtain my first SSTC “light” , accompanied by a powerful RF field. The video shows the very first tests, without any tweaking. The primary was set at 4 turns. The mosfet was getting hot quite quickly, with 100V input voltage. After a few tests, a value of 6 turns for the primary was selected, and a small top load was added. This greatly improved performance. 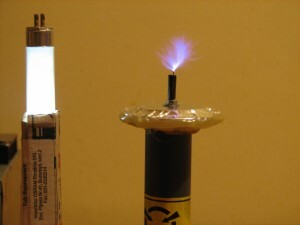 The tesla transformer, consists of a PVC pipe 1.5cm diameter, with the 1000 turns secondary, inserted inside a larger PVC tube of 2.5cm diameter. 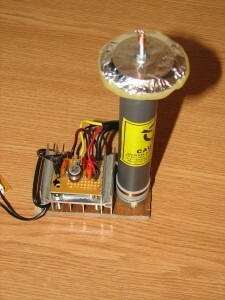 The primary and the feedback coils are wound on the larger tube at the bottom. A very compact design that also allows the two tubes to slide, so the primary+feedback goes closer or further from the secondary, allowing to tune the resonance in a very convenient way. Also the mosfet was much cooler now. 3) No breakpoint = dead mosfet – be careful! 4) The device produces strong RF interference, so be careful with all the electronics arround, including the digital camera, your computer, etc . Be careful not to touch any metallic object near the HFSSTC, it will burn you. 6) You will need at least 50V to power this oscillator. This is an absolutely BRILLIANT coil. The simplicity of it is just amazing. I just have one question though. How were you able to get the 50-100 volts required for the circuit and what is the minimum amperage needed? Thank you! I didn’t measure the current it uses yet, but will do that soon. Thank You so much for the reply. I was able to obtain a dula out put transformer that is able to give me 50volts @2amps and 100v@1amp. I was wondering about the secondary coil. 1.5cm diameter for a secondary seems VERY small. Is this a typo or is it supposed to be this. If so, would i be able to incorporate a larger secondary, for example, a 2-3cm diameter secondary. Would this have a negative affect on the coils’ output? I know it’s small, but my goal was to achieve a high frequency coil, so this fits perfectly. You can try bigger diameters if you have them already built, but if not, I recommend you try something similar to my design, to be sure it works. To good thing is you need very little wire for such a small diameter. i made this circuit and had it working. my Tesla secondary is 445mm tall by 40 mm diameter 0.5 mm wire 447 winds i had very tiny arc and burnt out $70 worth of transistors but they were Chinese would a recovery diode prevent damage or do i need a smaller Tesla coil? trying hard to tune it i will try your design to save money but was curious. First of all I want to say I really like your projects. 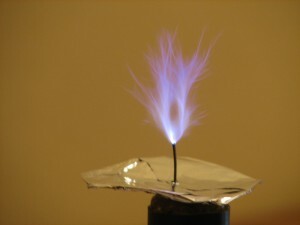 I am trying to build a tesla coil also but I am having trouble finding the necessary wire. Can you tell me please from where did you get the wire for the coils? Hey, did you measured the resonant frequency? Please let us know the frequency. Try a smaller tesla transformer. To tune it, try sliding the primary coil up and down over the secondary! Hi Ionut, thanks. I’m using the wire from the coils of some big relays. @Anowar, thanks, I will measure it and let you know. First thank you so much for your time help me. – when using circuit voltage triple The rated of diode capacitor ( Diode ampere) +(capacitors farad). I have seen your you tube videos on this. 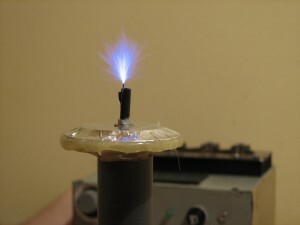 ive built the circuit and tesla coil, its about 3 inches by 9 inches with 900 Turns. i just see the pruple glow (corona) ontop. have about 120 v input into the circuit. Transistor Over heats, ive tried movin the coil up and down but it gets out of resonance. Hi CMS, can you post some pictures? at last a simple schematic for a sstc, could you tell me what the exact values of the caps and resistors are, im a nube at the finer electronics, i built a large spark gap TC but now want something a little smaller and finer. 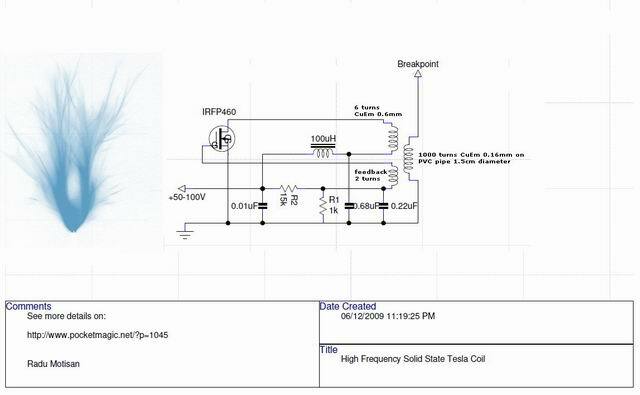 if you can direct me to a schematic that is just as simple to make a larger SSTC, or maybe even an audio modulated sstc. Indeed it’s a simple feedback air transformer, but gives some very good results: like a strong RF field as shown in videos. The caps values are show in the schematic, their voltage is probably ~250 – 400V , I can’t remember, but I’ll check that and get back to you. Good luck building your own. When it’s complete, post some pictures here, so I can include them in my article. great, thanks for the info. cant wait to get started on my own. about the voltage of the caps, I’m shopping for the parts and wanted to know if the voltage would affect the circuit significantly does “~250 – 400V” mean it makes no difference as long as its between those two values? i don’t want to get the wrong parts and have parts over heat, explode or anything of the sort. and about the top load, why would the MOSFET blow if there is no break out terminal? jaydenrr, the caps are not critical. actually a variac and a bridge is better, so go ahead and use that. 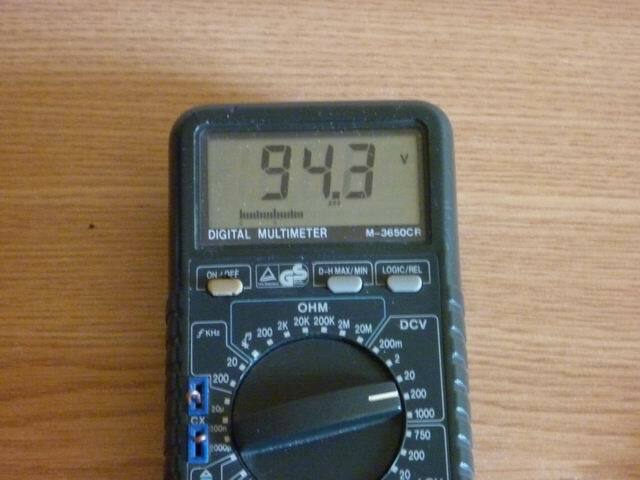 I have a 24V AC supply, and using a high current multiplier I got 100V DC. I believe this SSTC can take up to 120V without damaging the components. Make sure you start with 50V when testing and increase the voltage gradually. about the voltage of the caps, will any value between 250 400v work? im just a little pressed for time because i dont live in the US and these components can be a pain to get or ship to Mexico, so i need to do my shopping while im here. Yes, between 250 and 400 should be ok . The components I used where not new, they where taken from ATX power supplies. Last question what wattage and tolerance should the resistors be? now this is the last question, honest. what current rating should the 100uH coil be and what self resonant frequency should it have? my inductor was really small, probably handling 1A max. I suggest you use a bigger one, it should handle heating much better too. Whats the max size minimum size Coils that can be used with this circuit? max – min resonant frequency? or does it have to be the exact frequency and size in your setup, how do i vary it for my coil? i have 11 ” by 3″ around 450-600 Khz res freq. yes I think the key factor to this design is the frequency. You should try to raise it , not the opposite. BTW , can you post a few pics with your design? well if thats the key factor i’ll have to rewind a smaller coil. would u be able to give me any advice into a circuit that would be good to power the 13″ by 3″ tesla coil ive already wound a while back? i’ve got a pic of the coil and vid. how do i upload it for you to check? mosfet overheats within 20 seconds with heat sink, ive tried sliding the primary up and down the TC, mosfet still overheats. This is a really interesting driver due to its simplicity. I ordered a few IRFP460’s and im planning on testing it on a whole variety of different secondaries (all which have a resonant frequency of 3-4 MHz). What really ponders me is why did you use a SGTC-like secondary? Since your secondary is very tall and thin and has a really high number of secondary turns (most HFSSTC’s i’ve seen only have like 200-300 secondary turns) I feel like better performance could be obtained from a shorter and thicker secondary with fewer turns. Anyways, thanks for the schematic and I will post pictures once I finish building my driver. @clacid, looking forward to seeing your photos! The thin/tall secondary I used was what I had at hand at that time. The topload is not needed, but a breaking point is a must. So your experiments with various secondaries will bring lots of interesting details that other builder will probably find very useful. value of the inductor ? Hi Spark, none of the components are critical, but changing them can get you into problems obtaining breakthrough. outer tube and what Amps are best for the poer supply. @Spark, I’ve edited the article to add this missing info. Hope this helps – would like to see some pics of your setup. Using a 50V/8A and a bigger TopLoad the Goody worked. to be neat and tidy as soon as the original parts arrive. Credits & Backlink. Is that OK with you ? Nice to see your first results. From the way that fluorescent tube is lit, I’d say you got some strong RF field as well. It is the same in my case, but be careful with electronics that have field-sensitive sensors like touchpads – you can easily destroy them if they are too close to your HFSSTC. What about the mosfet temperature? Feel free to post the circuit anywhere you want, I would appreciate if you would include a back-link or credits. BTW, the name of this device is HFSSTC (from high frequency, of course). Cheapo DMM becomes useless even at a 1 mtr. distance…. Sounds good! Looking forward to your final variant. Hello I have one question regarding this really nice SSTC. What amperage can I get away with to power it? I’ve been looking at Variacs(I need to buy some form of PSU) and I’m not sure if 2 amps will cut it or not. If 2 amps won’t work, what do you suggest ? My setup was powered using a 24V AC @10A max, and a multiplier, so the output was 100V DC with a lower current capability. Using a Variac is the perfect solution, 2Amps is more then you need, but I will measure the current used and the voltage drop and get back to you. @Josh, I’ve added more details, see the bottom of the article. According to the update it’s using less then one amp! That’s good for me. I will look forward to more of your projects as they are interesting to read. Hello! I built the coil that you propose. I use a 100v transformer limited by a resistor at 2 amps and then rectified with a diode bridge. 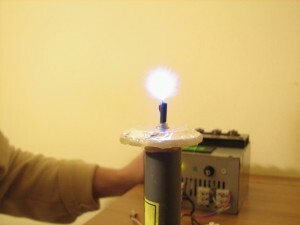 The coil works fine but the spark is not half as big as that of the video samples. Why can it be? From already thank you very much. Sorry for my bad English. I’m from Argentina and I use the google translator. @Tio octa, can you post some pictures with your setup? Is your coil similar to mine? Try changing the number of turns in the primary coil. The dc of the circuit must be smoothed with a capacitor? My supply for this SSTC uses a voltage tripler , 24V AC 50Hz in, 3 caps 4700uF/50V (if I remember correctly), 6A diodes. So you should also use a smoothing capacitor. bravo rado!!!!! its possible to make with 3000 turns? I was wondering if I could use 0.1mm copper wire at 1000 turns? yes you can use that, but make sure you keep to the indicated core diameter. Will that still be alright? Hello, I was wondering if you were ever able to use the ATTiny processor to change the frequency at which this operates. I am on 4hv, username is 92_foxgt, if you don’t mind shoot me a PM. I tried yesterday to build your device without the secondary, running it at 24V and using an IRF470. I used a 3.3K resistor instead of 1K, because I just didn’t have a big enough 1K resistor around. The primary and feedback coils are rather crude, 5 and 2 turns winded around a used roll of toilet paper. At first I used a computer power supply. I was working very smoothly, drawing about 100mA and producing about 6-7MHz (jumping up and down, due to the self-resonating unstable capacitance and shaky coils). Then I tried to use a variac with a rectifier, in order to increase the voltage slightly, to 30V. To my great surprise, it blew the 10A fuse inside the variac! I have no explanation for this weird behavior. The current, apparently, suddenly jumped up by two orders of magnitude. Did you experience anything like that? The transistor did not get shorted. It’s still alive, I checked it out. I can only tell you that you’ll need to spend some time tweaking this rather unstable design, but once you get it to work it will perform nicely. After all it is a very simple design and that is its main advantage. I didn’t get the current issue you’re describing ,. Would love to see your work, can you send me pics with your variant? What is the purpose of the 0.01uF and 0.22uF capacitors? Am I right in thinking the 0.68uF connected between the powered side of the coil and ground is the LC tank capacitor? I made the exact circuit, but nothing happens, no sparks at all 🙁 But there is voltage drop on my voltage trippler… what could be the problem? Miloš, try adjusting the feedback coil. You need to do a little bit of tweaking before you can get it to oscillate, but once you do that it will run stable. Mosfet does not get hot at all, and it’s just from the store… could it be dead? Okay, I got the first sparks! But only few millimeters 🙁 😀 My secondary is 8,6 cm tall 3,3 cm wide, 0,2 mm wire. Primary is 4T and feedback is 2T, but the IRFP460 does not get heated at all, and I’m driving the circuit on 130V DC… Everything else is same as in your circuit… Any suggestions? Did you try draw some arc from your coil?Is it like high power flyback arc? @James, probably it is possible to draw arcs. I don’t remember. 100v DC waveform requirements? 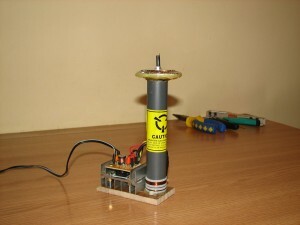 Can with 100v pulsating DC? I’m from China and I use Google Translate. Can you give some extra info for coil building. Feedbak coil must be in opposite phase like in other oscillator circuits? Distance from primary to feedbak windings?They are near close or some,few mm between? Some detalied photo of coil with few addnotation (which end wire where is connected) would be very helpfull. What about higher frequency?How frequncy affect SSTC? Increasing frequency will increase sparks? As a note,you may see on various site some hacking device,who can light a flourescent tube,based on 2SC2078.I calculated from their info thats working somewhere at 40MHz. Is possible from a derivation of their schematic to build a SSTC at such higher frequency? There isn’t much to say, best thing is to do a little research yourself, for the optimum configuration. The interesting fact is the coils can be moved one against the other to obtain the resonant coupling. Regarding the feedback coil, it is very similar to other oscillator circuits (and the working principle is the same), after all this is nothing but an Armstrong feedback oscillator. To increase the frequency, one way to go is to change the number of turns in the secondary. hi i have done successfully coil but wondered how it could increase the spark to make it as in their last videos.Por which is now as in his first video. @Carlos: increase the input voltage. do you use a AC oder a DC power supply to power the cascade? How big are the capacitors used there? Hi Radu.. I can replace the IRFP460 for IRFP450?? @julian: Yes, I think some of the guys commenting above already tried that. Go ahead and see how it goes, experimenting is fun! 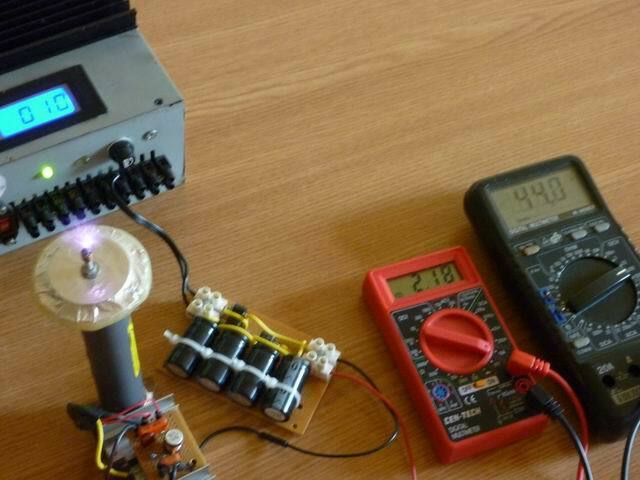 one of my friends is running same of your of your circuit at 27v 3amp transformer with good spark as yours .